Be worried. Be very worried. The “revolution” word got top billing on the BBC’s Newsnight. And, God forbid, the word “profit” was called “filthy” by a comedian, actor, radio host and author who has over seven million followers on Twitter. 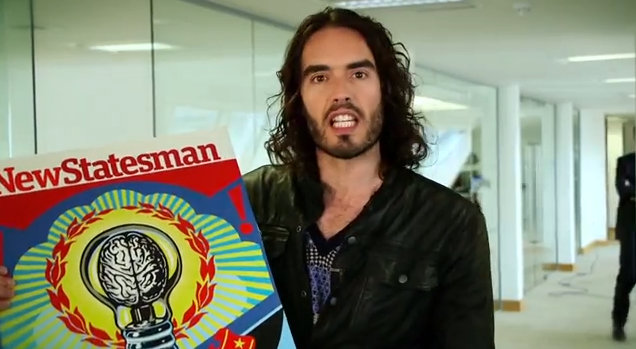 No wonder the media – right across the spectrum – is working overtime to give Russell Brand a thumping. In his article for the New Statesman, Brand flings down a barbed and well-crafted and often hilarious gauntlet – as he did in his confrontation with Jeremy Paxman last week. He challenges the notion that our present Tweedledee and Tweedledum parliamentary system is the only form that democracy can possibly take. He makes a strong claim that there is a revolutionary alternative. From the Spectator’s James Bloodworth to the Daily Mail’s Janet Street-Porter to the Independent’s Joan Smith, Brand is being tarred and feathered. Accusations range from that of “being a narcissist”, “spurning a right that people died for” (Spectator) to indulging “adolescent waffle about ‘revolution'”. How? By voting for Ed – let’s have responsible capitalism – Miliband? Surely, you are not serious Mr Watson. Defenders of the status quo all around are outraged that Brand dared to say what millions think: the parliamentary system is neither representative nor truly democratic. His attack on the political system and call for a revolutionary change touched a raw nerve because he points to the fact that the democratic emperor really has only a few tatters for clothes. Yes, his and Jonathan Ross’s prank calls to actor Andrew Sachs back in 2008 were unpleasant. But that was some five years ago and Brand has come a long way since, politically speaking. In 2009 he co-signed a letter from the Hoping Foundation to the Independent calling for an end to the Israeli attack on Gaza and attended the anti-G20 protests in London. Brandt remains a vocal supporter of the Occupy movement. In June this year he took part in a video backing US whistleblower Chelsea Manning. Last month he was ejected from the GQ awards for hilariously but seriously accusing sponsors Hugo Boss of being “Nazi tailors”, thus biting the very hand that fed him. Brand’s chief crime is that he calls for a revolutionary alternative. Not only that, but a socialist and inclusive one which is not dour and dogmatic but which links Britain’s legacy from Pagan times, to the English revolution, the Tolpuddle martyrs and the immediacy of the ecological crisis. Jibes that Brand’s call to arms are just “banalities about revolution”, that “wild emotions are all very well” and “where’s your programme?” are just that – cheap and nasty jibes by defenders of the status quo. They emanate to use Brand’s eloquent words, from “people who have never struggled, who are a dusty oak-brown echo of a system dreamed up by Whigs and old Dutch racists”. The furore that Brand’s remarks have caused shows the established commentariat in their true colours, dismissing the idea of a revolutionary change while clinging on to their own privileges and positions. They are the ones living in the past while Brand looks to the future. We’re with him all the way. THE BRAND INTERVIEW CONFIRMED OCCUPY IS NOT DEAD. 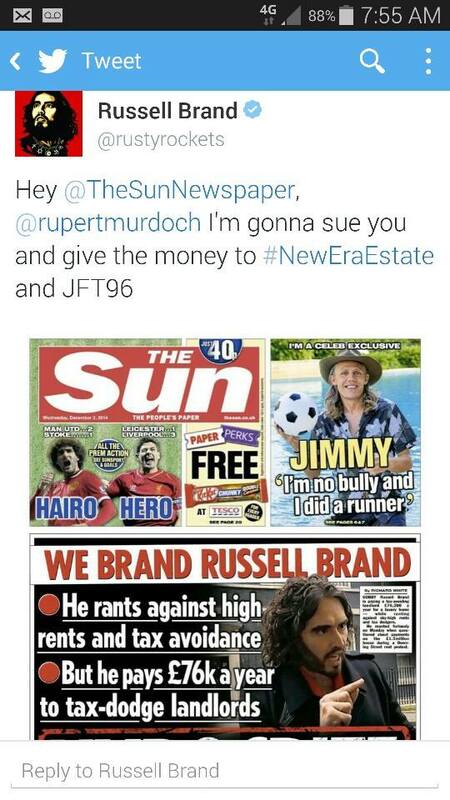 Rupert Murdoch’s The Sun Attacks Russell Brand.